Certain students are more likely to be arrested at school, the report found. Black girls -- about 13 percent of female students -- accounted for nearly 40 percent of the girls arrested in schools and were arrested at least four times more often than white girls. Latino and Latina students were arrested in schools at a rate 1.3 times higher than white students. Native American and Pacific Islander students were more than twice as likely to be arrested as white students nationwide, the report found. (NurPhoto via Getty Images, FILE) A student wears a button that says: "Counselors Not Cops" at a forum to examine evidence-based violence prevention and school safety measures, on Capitol Hill in Washington, D.C., March 20, 2018. Meanwhile, mental health professionals are often "the first to see children who are sick, stressed, or traumatized -- especially in low-income districts," the report found. Having mental health professionals at schools leads to better attendance rates, academic achievement and graduation rates, while bringing down the rates of suspensions, expulsions and other disciplinary incidents. Data show mental health professionals in schools "can also improve overall school safety," the report found. Levels of depression and anxiety are at record highs for school children, the report said, which cited a 70 percent increase in suicide rates for children ages 10-17 over 10 years, from 2006 to 2016, according to the Centers for Disease Control and Prevention. "By contrast, there is no evidence that increased police presence in schools improves school safety," it stated. In 2014, the Obama administration attempted to address the fact students of color across the country were often disciplined more than their peers by warning schools that if they had high racial disparities in disciplinary reports they'd be subject to a civil rights investigation. 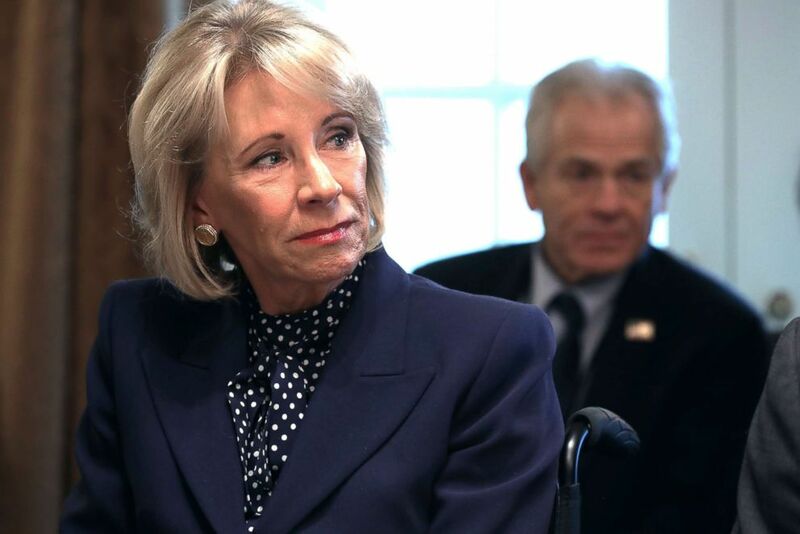 But Department of Education Secretary Betsy Devos has begun to roll back this policy, saying local schools should make decisions free of federal guidance. Asking schools to hit "racial quotas" with their disciplinary actions instead pressures schools to let students off the hook because of how the numbers will look, DeVos said in a statement about the policy updates last year. (Chip Somodevilla/Getty Images, FILE) Education Secretary Betsy DeVos listens to U.S. President Donald Trump talk to reporters during a cabinet meeting at the White House in Washington, D.C., Feb. 12, 2019. Whitson remembers working to lower this ratio in her district, Monrovia Unified, when a school counselor asked her a question while they were out to dinner. At the time, Whitson's goal was 500 students per counselor. "She asked me, 'Do you know the names of 500 people?' And I said, 'I don't,'" Whitson said. "And I will never forget that, because what we're trying to do is not know a student's name but know their story, so we can be of assistance to them. But how could you with that many people?" A lot of the time, counselors are "dealing with almost an urgent care situation" when students come to them in tough situations -- often the first "band-aid to the injury," Whitson said. "Some districts chose counselors, and some chose police officers -- that was the beginning of that, at least in California," Whitson said. It was around this time that federal dollars also increasingly went to police in schools, beginning with a Department of Justice program that has spent nearly $300 million on school policing infrastructure since 1995, according to a 2017 report from the ACLU. The trend continues today to combat a wave of deadly school shootings. According to the report, "six months after the Parkland school shooting, more than $1 billion was added to school security budgets by state legislatures, with funding for School Resource Officers (SROs) being one of the largest items." 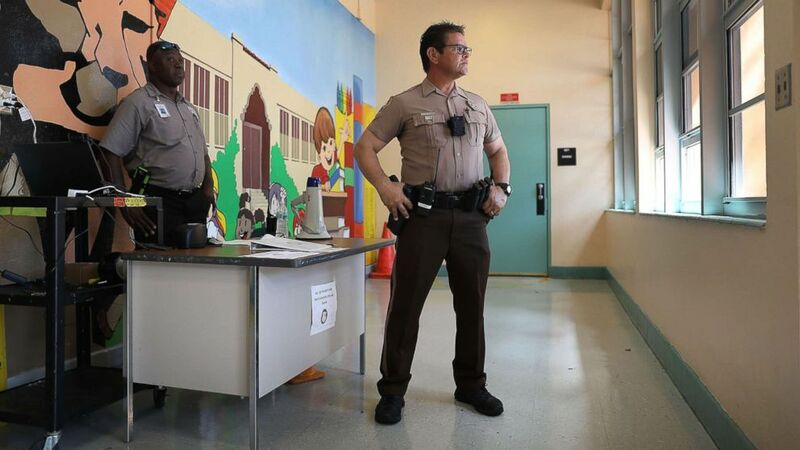 (Joe Raedle/Getty Images) School security officers guard the the front entrance to the Kenwood K-8 Center in Miami, Fla., Aug. 24, 2018. Whitson, who oversaw a district where around half of the students were considered "socioeconomically disadvantaged" in 2016, recalled clear examples throughout her career where students would've been better off with access to counselors. In one case, she had to sign off on the expulsion of a girl who got in a fight at school and hit a security guard while the fight was being broken up -- a situation Whitson saw as completely avoidable had counselors intervened before punches were thrown. "If we'd done an ounce of prevention, it would have shifted everything for this girl," Whitson recalled. "I was very angry that it wasn't handled before it got to that point." Expulsion, however, is the tip of the iceberg. Students who attend schools with police officers instead of school resource officers or security guards also can face formal criminal charges -- most of which "arise from criminalizing common adolescent behaviors," the report found. "For example, students have been charged for 'disorderly conduct' for cursing, for 'drug possession' for carrying a maple leaf, and for 'disrupting school' by fake burping,” the report found. In Florida, one of the only states with detailed data on youth arrests, more than 60 percent of school arrests were for misdemeanors -- the most common of which was for fighting, which was charged as "assault/battery." The second-most-common was "disorderly conduct."